This is the final of three entries in Debra’s No, You’re Crying Blogathon being held over at Moon in Gemini. Thanks for letting me participate Debra! My Take on it – This film is considered to be one of the very best biographical movies ever made and that largely has to do with the fact that they had had so many consultants who knew Gehrig himself. Gary Cooper is amazing as the lead role and was even able to manage to imitate many of Gehrig’s mannerisms that even Gehrig’s wife felt she was watching her husband on screen instead of an actor. This film has so much realism because of numerous factors; the film makers were assisted by friends and family of Gehrig who both acted and gave advice on the actual story which happened not long before the film was released. The speech at the end by Cooper is one of the most memorable ones in film history and is such an emotional one that it really is hard to fight back the tears knowing what the speech really means. This film was nominated for 10 Oscars that year including Best Picture and Actor yet only one an award for Best Film Editing. Bottom Line – Considered one of the best biographical films ever made. Cooper gives an amazing performance as the late Yankee great. The fact that this film had the cooperation and help of family and friends of Gehrig helps made this feel even more realistic. Nominated for 10 Oscars including Best Picture and Actor, but only managed to win 1; Film Editing. The speech at the end is one of the most heartfelt in film history and it’s hard to keep the tears from flowing. Highly Recommended! Great post! I haven’t seen this film yet, but increasingly I become more and more interested in sports film, and especially baseball movies, so will be looking forward to seeing this. I agree, Gary Cooper is so noble and graceful, full of dignity and strength that it is very hard not to get choked up during this film’s masterful climax. 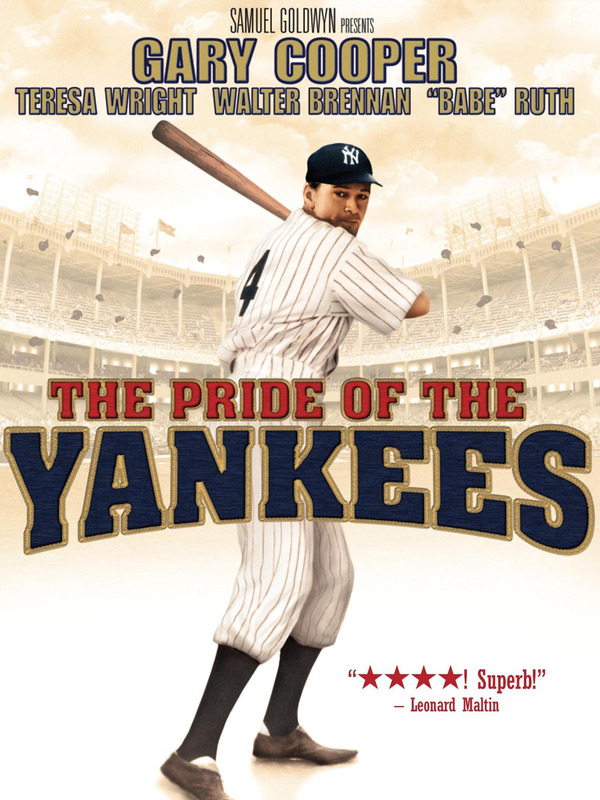 “The Pride of the Yankees” is a great sports film. One that I can appreciate! I’m an abashed (as opposed to unabashed) Gary Cooper fan. I always felt he came across a bit wooden in some of his performances. In others, he was great (High Noon). This movie is one of his great ones. He captures the playful yet stoic nature of Gehrig and is a reasonable stand in (even bearing a physical resemblance) for one of the great baseball players of all time. To look at Gehrig’s career stats – knowing that his career was cut so tragically short – is remarkable. To know that the “Iron Horse” was felled by a disease so debilitating (and ultimately named after him) is so ironic. I am a lifelong New York Yankees baseball fan – and a big fan of baseball movies (Field of Dreams, Eight Men Out, Bull Durham), and this is one of the best. I went to a Yankee Fantasy camp – and on the last day – the “campers” played against a team of actual ex- and retired Yankee players. All week long, the games were photographed and videotaped. While waiting to bat in the campers vs. Yankee game, the videographer came up to me in the on-deck circle and asked how I felt. My reply, “Today (today…today..) I feel like the luckiest man (man…man…) on the face of the earth”. The movie was made with a lot of care and affection for Lou Gehrig. It deserves its reputation as one of the best biographical movies. This is such an excellent film. So much attention to detail and connection to Lou Gehrig, as you mentioned. Teresa Wright was also quite wonderful. Overall, an ultimate tear-jerker! I cannot remain dry-eyed during that last scene, no matter how many times I see it. I recently watched this again, and it still holds up. I’m also not a big Gary Cooper fan, but this is one of his performances that I really enjoy. It helps that I grew up surrounded by Yankees fans! The detail about the bracelet gives me an excuse to watch it one more time. Thanks so much for reviewing this for the blogathon!